Travel can be expensive. After the flight and rental car, you have to find a place to stay. Hotels are an option, of course. 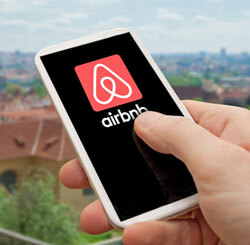 But there is a relatively new option: airbnb. Airbnb is a service in which people rent out all or part of a private home. It has several pros, including that you probably have most of the amenities of a home, including multiple rooms, kitchen privileges, laundry, etc. It also can be less expensive than a hotel. And since it usually is in a residential area, you can get a better feel for the city you are visiting. On the other hand, it is not a hotel. That means that there is no on-site concierge, restaurant or room service. You also can’t look for a particular brand, as you might with a hotel; perhaps you always stay in a Hilton or a Marriott, for example, so you know what to expect. If you are considering airbnb, you have to do your own research. Experts have several suggestions for ways in which you can increase your odds of having an enjoyable airbnb stay. First, make a list of what is most important to you. For example, do you want a house or apartment all to yourself, or are you OK with renting a room in someone’s home? Do you need to be in a particular location? Do you need reliable wi-fi? Off-street parking? Access to public transportation? A place that allows dogs? Look for these things first when you are checking airbnb listings. Also look for warning signs. Even the best places can have an occasional unfavorable review. But if many reviewers over a period of time complain about the same things, that is a red flag. Obviously you want to steer clear of a place that has bed bugs or mice, but you also might want to avoid a place where numerous people have commented on the unreliable wi-fi. Not only can that be an inconvenience, but it also suggests that the owner is not interested in fixing problems that renters point out. Read what previous guests have said about the host. You want a host who is responsive, in case you have a question or an emergency. Reviewers often mention a host’s responsiveness, and you also can judge responsiveness by the quickness of the host’s response to a message you send. Make sure you understand all the rules of the house – and that you respect them. If you don’t feel you can comply with a rule, choose another location. Most rules are meant to protect the owner’s property and to ensure that visitors don’t disrupt the neighborhood and cause complaints. Some experts suggest that first-time renters look for a place with more rules rather than fewer. They say that indicates an owner who is serious about taking care of the place – and the renters. It also can ease the mind of people not familiar with airbnb who might be wondering what they can and cannot do. Finally, don’t be shy about asking for discounted rates for extended stays, or for making special requests of owners. After all, the worst they can do is say no. And when you have finished your stay, take a few minutes to write a review so that other people looking at that place can benefit from your experience.